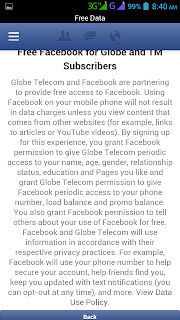 Globe Telecom offers free Facebook browsing to all their subscribers using feature mobile phone and smartphones. This promo is available on both prepaid and postpaid users via default browser or Facebook app. This offering made possible with the partnership of Globe Telecom and Facebook giving every subscribers freedom to share and stay connected always. With the promo, you can access Facebook mobile site, posts comments, status, chat with friends, share and upload photos at zero cost. 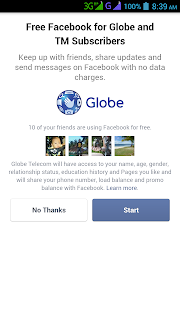 How to access free Globe Facebook? To avail or register to free Facebook on your Android, iPhone and other features phones you need to configure your phone settings correctly. Access to FB also needs GPRS, EDGE, 3G, HSDPA capable phones to connect your phone to the internet. Speed may vary depending on the signal of your area where you're accessing FREE FB, for better and faster speed loading you phone and area must be 3G/HSDPA ready. 1. Configure your phone to use the correct Globe/ TM GPRS, MMS and settings. 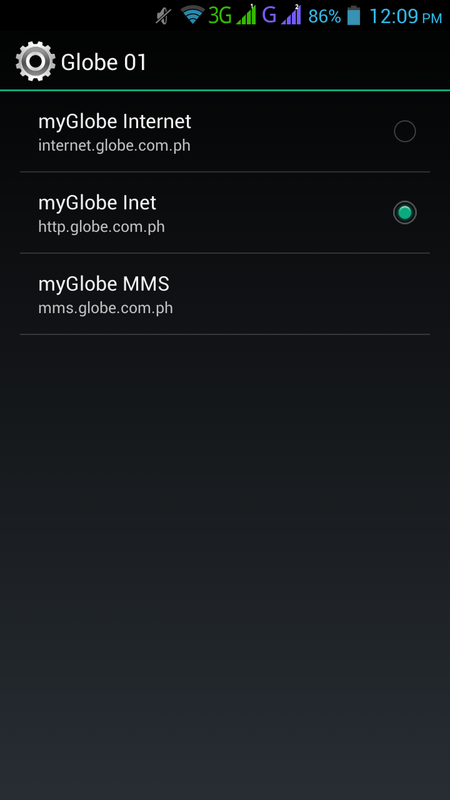 You need to use http.globe.com.ph APN to use this service. You can check our TM / Globe APN settings here for reference or text GO to 2951. 2. Text FREE FB to 8888 or you can dial *143# on your phone menu the select FREE FB. Wait for the SMS confirmation. 3. Use your default mobile browser or official Facebook Mobile App. On your default mobile browser just type m.facebook.com and for app users just launch and run your app to use this service. That’s it guys, start using Facebook for free only from Globe and TM. Promo period last until January 25, 2014. 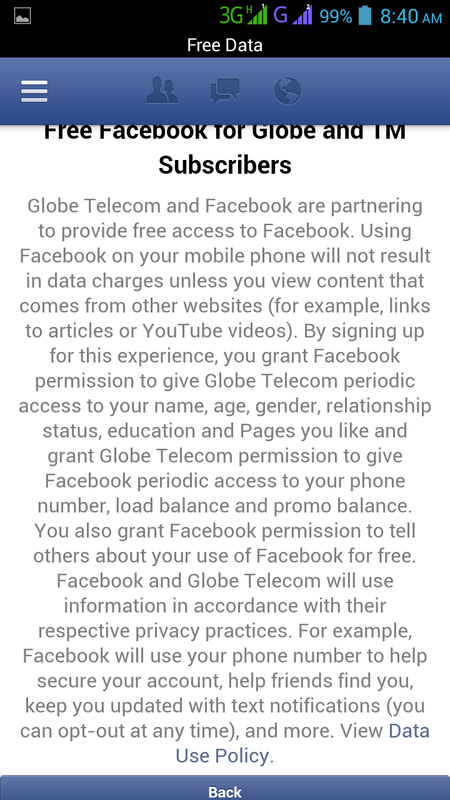 Do note also that FREE FB is not available on Blackberry, Opera Mini and Nokia Express browsers for now. To avoid unwanted charges while registered to this service please don't click any link pointing outside Facebook domain. Like for example, a friend of yours shared a Youtube video on your wall then you click it and watch the video Globe will automatically deduct or apply regular browsing rate on your account. Don't you worry guys as this scenario won't happen without your consent as you will be notified when you click outbound links and you'll given an options to continue or apply for data plan. You are also given an option to loan or borrow a 10MB data plan in case you don't have enough balance that will be deducted on your next reload. 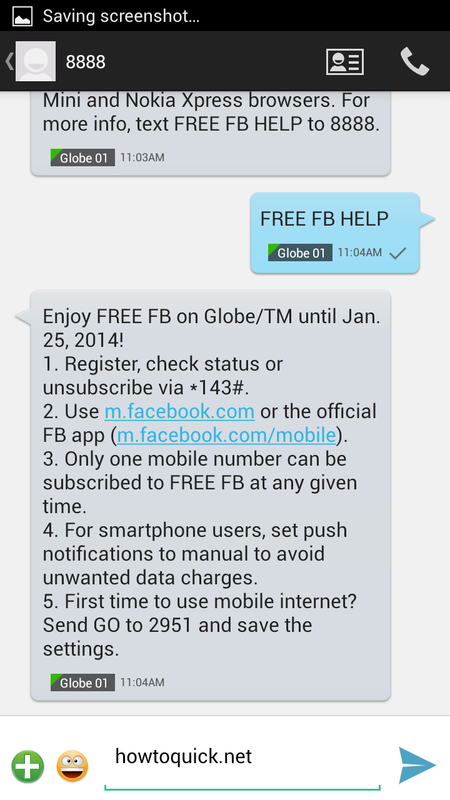 To stop, unsubscribe and check your FREE FB status, you can text FREE FB HELP then send to 8888. 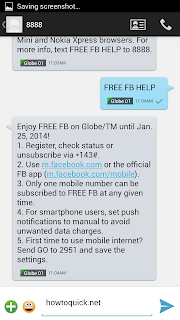 You will receive SMS text notifications containing the details about Globe Free Facebook browsing. can you tell me how did you do it?? Nabawasan po ako ng 10 peso load. Sinunod ko naman lahat ng instructions pero nabawasan parin ako. Ngayon wala nakong load hindi nako makapag fb. Need ko na mag wifi. Sayang naman credits ko di ko nalang ulit gagawin to kinakain lang load ko. Hi..my apn settings was already set pero hindi pa din maka-connect..i'm using sony ericsson xperia. Please help..thank you! how can i use this in skkA11 mobile,web page not available in browser? hindi ako maka connect with my iphone 6 ng free fb for TM .. Peru nung gamit ko po yung TM ko with my other phone which is android, nakakonekta po .. panu po ba pag sa iphone 6? Help po .. Registered to gosurf99 at naka freefb gumana yung freefb sa isang araw lang, sa mga sumunod na araw nagcha-charge na ng data hanggang sa naubos na mb ko at wala ng mga images at hindi na pwede i-play yung mga video... bale, gumana lang yung free fb sa loob ng isang araw, kahit na text ko na yung 8888 ng "Free fb" at "Free fb on"...BWISIT! kapag naga signing in wala labas ang mga imahe pero kung walang signing in halimbawa facebook.com/rodrigodutertelines nakalabas na diyan sa imahe kapag walang Logging in pero naka login ka na sa facebook account pero walang labas sa imahe at kailangan mag paload sa ExternalLoad pero nag nalimpuwasan dahil sa free basics ng 0.internet.org at kung kulang ka sa permit na ito ang freefb ano ka TangVuvo te gani kung walang habang gumamit ng freefb sana na timeout na ang facebookbrowse kay gusto nya namam ExternalLoad naman tani na no longer na ang freefb keyword dyan Teeh! TangVuvo Ka gid no Edi Wow! isusugbong kayo sa mga talakay ng NTC Approval. Pweeeeeee!